Want to see exactly what you'll get when the Gamma World boxed set comes out in October? 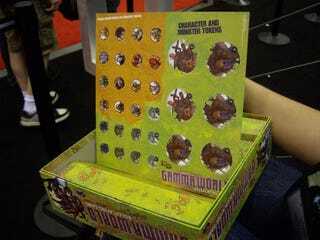 I've not exactly been coy about my excitement for Gamma World, so when I spied a Gamma World box sitting on the shelf of the Wizards of the Coast booth store at GenCon, I had to ask. Can I peek inside? After determining that it was not just a mockup, I was allowed (by Katie the Awesome D&D PR Sorceress) to take photos of the treasures within. Keep in mind that this is still a pre-production version of the box - the rulebook, for example, was about ten pages of material and a lot of blank white pages. Still, check out the character sheets, deck of cards, two poster maps, the rulebook plus the two-sided creature counters in the top photo. That map is full of post-apocalyptey goodness. So what's up with the decks of cards? From what I was told, they act sort of like Planechase cards. They come into play and bestow some kind of global or personal effect that will shake up the encounter. This appears to be a box of random 8-card booster packs with more of the cards. I'll try to find out more about what that's about. For now, you'll have to be content with these pictures while we wait for the game to hit stores in a few months. This post originally appeared on Robot Viking.